One of the easiest breads to make first is a pizza base or a flat bread. It’s a great baking project for testing new flours, learning to knead and roll dough and it’s easy to cook as you can watch it bake in the oven, topped with the ingredients of your choosing without fear of affecting the dough. In our guide to how to make gluten free bread, we’ve compiled some of the best recipes, videos and tips to make your bread production that much easier. We’ve also covered a range of bread types from loaves to speciality pastries for those who would like to push their skills a little further. For the majority of recipes, simply replace the flour with an equivalent type of gluten free flour. Always check your yeast is gluten free and convert the American recipes from fahrenheit to celsius. If you would like to skip straight to machine made bread, or breadmakers, you can do so here. Mix the flour and butter in a large bowl. Add the yeast at one side of the bowl and add the salt at the other. (Salt kills yeast). Stir all of the ingredients with a spoon. Add half of the water and turn the mixture round with your fingers. Continue to add water a little at a time until all of the flour from the sides of the bowl are included in the mix. Add just enough water to make the mix pull together but is not sticky or soggy. Mix until the ingredients are well combined and pulling any materials from the wall of the bowl. Keep going until the mixture forms a rough dough. Use about a teaspoon of oil to lightly grease a clean work surface (avoid using flour or it will make your dough dry). Turn out your dough onto the greased work surface. Fold the far edge of the dough into the middle of the dough, then turn the dough by 45 degrees and repeat. Do this several times until the dough is very lightly coated all over in olive oil. Use your hands to knead the dough. Push the dough out in one direction with the heel of your hand, then fold it back on itself. Turn the dough by 90 degrees and repeat. Do this for about five minutes until the dough is smooth and stretchy. Work quickly so that the mixture doesn’t stick to your hands – if it does get too sticky you can add a little flour to your hands. Clean and lightly oil your mixing bowl and put the dough back into it. Cover with a damp tea towel or lightly oiled cling film and set it aside to prove. The dough should double in size in around one hour, but will vary depending on the temperature of your room. Don’t try to force the rise by warming the dough or you risk killing the yeast. Line a baking tray with baking or silicone paper (not greaseproof paper). Once the dough has doubled in size, scrape it out of the bowl onto a lightly floured worktop. The texture should be bouncy and shiny. “Knock it back” by kneading it firmly to ‘knock’ out the air. Use your hand to roll the dough up, then turn by 45 degrees and roll it up again. Repeat several times. Gently turn and smooth the dough into a round loaf shape. Place the loaf onto the lined baking tray, cover with a tea towel or lightly oiled cling film and leave to prove until it’s doubled in size. This will take about an hour, but may be quicker or slower depending on how warm your room is. Preheat the oven to 220C (200C fan assisted)/425F/Gas 7. Put an old, empty roasting tin into the bottom of the oven. After an hour the loaf should have proved (risen again). Sprinkle some flour on top and very gently rub it in. Use a large, sharp knife to make shallow cuts (about 1cm/½in deep) across the top of the loaf to create a diamond pattern. Put the loaf (on its baking tray) into the middle of the oven. 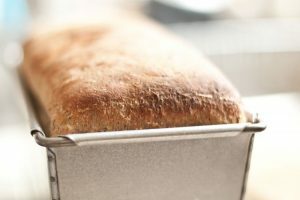 Pour cold water into the empty roasting tray at the bottom of the oven just before you shut the door – this creates steam which helps the loaf develop a crisp and shiny crust. Bake the loaf for about 30 minutes. The loaf is cooked when it has risen and turns golden. To check, take it out of the oven and tap it gently underneath – it should sound hollow. Turn onto a wire rack to cool.